Bullie pledge: I will not chew crayons or pens, especially not the red ones, or my people will think I am hemorrhaging. If you are interested in viewing dogs owned by visitors to this site please feel free to visit the gallery. The Bullmania gallery is not currently accepting any more submissions for the time being. Please check back again in the future. There is an articles section which has non-breed specific articles about training your dog, medical information and more. The site has been put on hold for now. Unfortunately with my day job and volunteering for Bullies In Need I no longer have the time to keep the site updated. It will be back and better in the near future though so please check back again. For the time being please enjoy the following story about Skye, a dog helped into a caring forever home by Bullies In Need. Article submitted by Geoff Davies. This is the story of one of my fosters that I called Skye a 2year old ebt that had been mistreated. It was a nice sunny Sunday back in September when I had agreed to meet matt who was adopting my foster then molly she was such a loving little girl I very nearly failed but knew my work with B.I.N had to go on so very upset I let her go. The following day I rang Lisa the rehoming co-ordinator for B.I.N and said I didn't think this was for me cause I was so upset at letting molly go but I knew deep down that matt would do me proud by molly which has turned out to be the case thank you so much matt & family. So here goes. I was working in the West Country when I received a phone call from Lisa who asked me could I collect a 2-year-old ebt from Somerset so after asking a few questions I agreed wow I had a new foster. After a few phone calls I met the lady from the pound at a service station just of the A303 after all the pleasantries were exchanged I asked where the little girl with no name was and was told in the van well lets see her then. The kennel lady got this little girl out of the van it was then that my heart sunk Jesus here was a little dog that had been so mistreated and unhappy I could see in her eyes she just didnâ t want to be here anymore it really broke my heart to see her like this so I decided there and then I wouldnâ t give up on her and she would receive my total attention. I lifted her out of the van and looked in her eyes and see they were vacant like there was no bt there just a shell of a dog it was heart breaking to see but knew I could mend her if she let me. I rang Lisa and told her the situation and the problems that this little girl had i.e. she had been beaten and may have brain damage, her nails were curling over and cutting into her feet, she had cigarette burns on her body, her ears were compacted with infection, and it seemed she was blind in one eye just some of the problems this little girl had. I will admit know I did something I never normally do when transporting I let Skye curl up on my lap all the way home and something else I admit I was in tears all the way, hey this little girl had got to me already and I wanted to make her as comfy as possible and if it meant her sitting on my lap so be it. So we got home all ok with out any hiccups I gave Skye a good meal and she settled down for the night and all was well till the next day whilst on the phone to Lisa she became very agitated and turned on me in a big way wow she was scary I just managed to get her in a crate before any damage was done it just so happens that I was speaking to Lisa at that time and she said that I must do whatâ s best and I must be confident that we could rehome Skye at the end of her stay with me I asked Lisa if I could have some time working on Skye and to her credit told me to just get on with LOL she supported me every single step of the way and spoke to me every day for updates and guess what Skye was turning the corner , my vet was working hard on Skye and I was putting lots of time in with her just to build her confidents back in humans and it was working thank god. After about three weeks Skye was really turning the corner. She was still a bit snappy around food but that's something we could deal with quite easily her feet, eyes, and ears were on the mend but we found out she was deaf and partially blind in her right eye but I didnâ t care cause she was coming round and becoming a very loving little girl who just loved to sit behind me and lick my ears and head for ages also her and paddy seemed to have quite a special bond. After two months Skye really had become a beautiful little girl who was really growing on me and I knew at some time really soon I had to make that decision to keep her or rehome her. I spoke to Lisa and said Iâ m not sure weather I want to let her go who then informed me that a really nice couple had applied for Skye and would I like to speak to them very reluculently I agreed the only problem I could see was that they lived in the west of Ireland WOW what a home check this going to be. So of to Ireland I went to do the home check and it all went well and what a nice couple. Now it was time for them to come and meet Skye so I arranged to meet them at a train station near me they flew in and I met them and brought them home to meet my little Skye is this going to be a sad day for me well yes it was Katherine and Skye got on so well I just knew this was right for her they both had a real twinkle in there eyes for each other and Harry got on so well with her to so I agreed with Lisa the rehoming co-ordinator that they could take Skye back with them now there was no problems with that as Katherine worked for the airline. So of to Luton airport we went this was one of the saddest days of my life but I just knew it was right for Skye and more importantly Skye knew it to at Luton airport I was getting very stressed out because my little girl was going and took my frustration out on a airport worker and had to make my apologies quite quickly before I got ejected out of the airport and I was desperate to spend as much time with Skye as I could and thatâ s what I did I waved my goodbyes and of they went. My drive home was once again a very tearful one but hey I was upset at Skye going but so pleased that she was going to be with Katherine, Harry & Finney her new little brother a Sussex water spaniel who I must add is a wonderful little lad. About 3 hours later I received a phone call from Harry to say they all got home ok and all was well that really settled me down. I flew back to Ireland in December 2006 to do a follow up on Skye and I couldn't want better for her she is doing so well and is very much loved. If you enjoy this site please vote for it by clicking here. Please vote for this site by clicking the image below. Thank you. 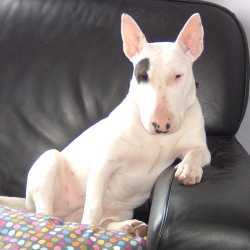 This Bull Terrier Ring site is owned by Bullmania - Bull Terrier Information and Gallery.